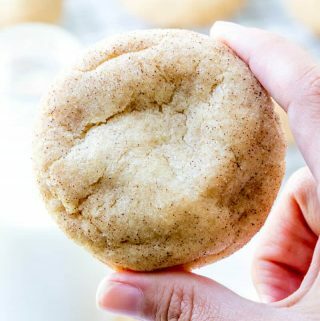 Chewy, fluffy and delicious this Snickerdoodle Cookie Recipe is a family favorite that has subtle hints of cinnamon and sugar in each and every bite. Preheat oven to 350, line a cookie sheet with parchment paper or silpat mat and set aside. In a medium sized bowl whisk together flour cream of tartar, baking soda, baking powder, salt and cinnamon. In bowl of stand mixer beat together your butter and sugars until light and fluffy, add in your eggs one at a time mixing well after each addition. Slowly add your dry ingredients into your wet ingredients and mix until combined. In a small bowl whisk together more sugar and cinnamon and set aside. Using a medium cookie scoop, scoop about 1 1/2 Tbs of dough and roll into ball then roll into cinnamon sugar mixture and place on baking sheet about 2 inches apart. Bake for 8-10 minutes, they will look slightly underbaked but that is what you want. Remove from oven and cool on pan for 5 minutes before transferring to cooling rack to cool completely.